RALEIGH, N.C. — The state is arranging for a large transport ship to ferry trucks and supplies into the Port of Wilmington to relieve shortages in the city caused by flooding. The MV Cape Ray, a 648-foot-long “roll-on, roll-off” ship, is expected to arrive at the state port in Morehead City late this week and be available to take on trucks full of food, fuel, construction materials and other supplies, state Secretary of Transportation Jim Trogdon said. Rising rivers have all but cut off roads in and out of Wilmington, including Interstate 40, U.S. 74/76 and U.S. 17 from the south. State officials say there are tenuous routes into the region used by first responders and military vehicles, but they say those roads are not safe for public use. Trogdon said state officials began talking to the U.S. Department of Transportation on Sept. 16 about options for bringing supplies in by boat. 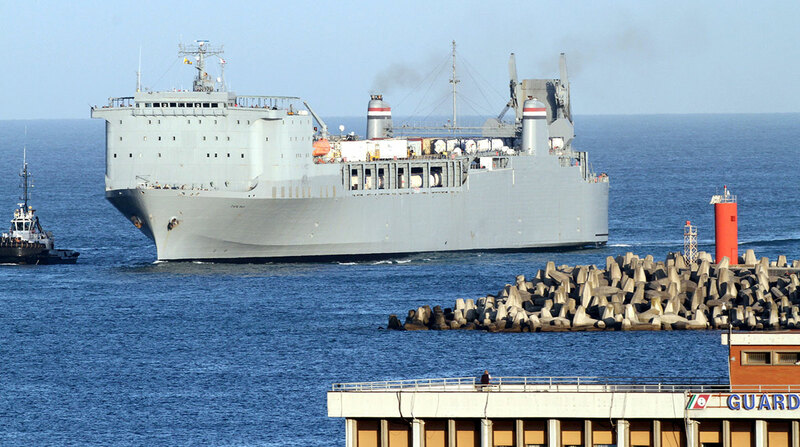 The Cape Ray, part of the Ready Reserve Force used to deliver military equipment around the world, happened to be in Jacksonville, Fla., where it was just completing a mission for the Department of Defense. Trogdon said the Cape Ray was on its way from Florida up the coast Sept. 18 and that the U.S. Army Corps of Engineers and the Coast Guard had helped make sure that the ports of Morehead City and Wilmington are capable of handling the ship. He said based on his conversations with the Coast Guard, this would be the first time a ship is used to carry emergency supplies to a mainland U.S. port after a storm. Trogdon said NCDOT has begun directing Wilmington-bound trucks to Morehead City but that he doesn’t know how long it will take to load the ship and get it to Wilmington. He said he hopes the roads into Wilmington reopen soon, though the Cape Fear and Northeast Cape Fear rivers are expected to be above record flood levels into the weekend, according to the National Weather Service. Trogdon said NCDOT had considered using its own ferries to bring in supplies but that the Cape Ray can carry so much more. “One lift of this vessel would be 100 times greater than what we could do with the ferries,” he said. In the meantime, NCDOT is using two of its ferries to bring fuel, trucks and equipment from Cherry Branch, near Havelock in the Neuse River, to Fort Fisher at the mouth of the Cape Fear River. The two ferries normally run between Southport and Fort Fisher and made the 14-hour journey to Cherry Branch to ride out the storm. They were expected to arrive back at Southport about 9 p.m. Sept. 18 with NCDOT crews that will work to clear and reopen roads. The state is using other ferries to carry supplies to isolated areas as well. With travel by road to Cedar Island in Carteret County still tenuous, a ferry is bringing groceries, water and other supplies over Pamlico Sound from Ocracoke, NCDOT spokesman Jamie Kritzer said. The ferry from Hatteras Island to Ocracoke remains closed to the public, but it is carrying equipment to help clear and rebuild N.C. 12 on Ocracoke, Kritzer said. Service on the ferry between the Swan Quarter and Ocracoke expanded Sept. 18 to include nonresident property owners; visitors will be allowed to return to Ocracoke starting Sept. 21. Meanwhile, the Pamlico River and Neuse River ferries are making test runs in hopes of opening later this week, Kritzer said.